Establishing a legacy or charitable fund at the Community Foundation is a simple process that starts with a conversation. We begin by meeting with you and/or your professional advisor to identify what you would like to accomplish and how best to get there. Every individual, couple and family possess distinct values and wishes that drive their charitable goals. Our clients choose to work with us because of the customization and flexibility we provide, our sound management of charitable assets and our deep knowledge of the Western New York community. Some clients come to us knowing exactly what organizations and causes they want to support, while others utilize our team and experience to guide them as they establish a charitable legacy. Either way we have the expertise to help you make an impact today, tomorrow and forever. Together, we establish an agreement that outlines your wishes. For instance, do you want to support a specific organization or issue area (e.g., education, arts and culture, equity, health, the environment)? Or do you want to decide along the way which organizations you wish to support? You can make a gift in cash, appreciated stocks, real estate or other assets right away or through an estate plan. Once assets are received, the fund is set up and named according to your wishes. We handle the administrative details (check writing, investments, IRS filing, etc.). You choose whether you want your fund to be endowed or non-endowed. Clients with endowed funds at the Community Foundation have their fund invested with our combined assets of nearly $485 million, giving them access to a diverse portfolio managed by more than 40 carefully selected investment managers. This endowment was established with $2.1 million in 1978 through a legacy lift (bequest) to the Community Foundation from a parent in honor of his son who died tragically as a young man. 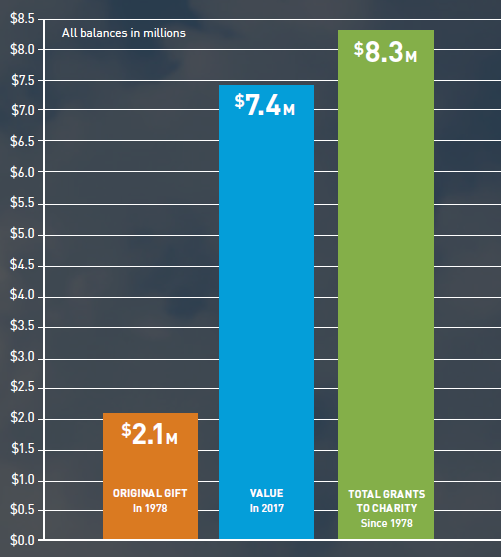 Today, decades after both father and son have passed on, the initial gift has more than tripled to $7.4 million, all while giving $8.3 million in grants to the organizations they cared about. Their fund will continue to honor this family’s charitable giving legacy by making grants to their favorite organizations in their name, forever. You can simply write a check or have cash transferred directly from your bank account to the Community Foundation to establish a fund or add to an existing fund. Contributing with a noncash gift may allow you to diversify your assets and receive the maximum tax advantages. You can choose to do this with assets like the ones listed here. Donating assets, such as stocks, bonds, mutual funds and other securities that you have owned for more than a year may be a more advantageous way to give rather than using cash. If you use securities that have appreciated over time to fund a charitable gift, you may be able to maximize the size of your charitable gift. Retirement assets may face tax rates of up to 75% if left to a family member other than a spouse. This makes them attractive assets to use for charitable giving, leaving more favorable assets for family members. You can name your fund at the Community Foundation as the beneficiary of your retirement funds. If you are considering passing on your business, there is an opportunity to contribute a portion to the Community Foundation and fund your charitable giving for generations to come. This is a powerful tool to offset gains and fund your charitable giving. Making a gift of life insurance to the Community Foundation is both easy and cost-effective. You simply designate the Community Foundation as a primary, secondary or contingent beneficiary to the policy. Tangible personal property such as jewelry, art, automobiles or antiques may be accepted as gifts. *Requires a qualified appraisal and a completed IRS Form 8283 is required. Including a charitable bequest in your Will is another way to make a lasting gift to your community. When you make this gift through the Community Foundation, we establish a special fund that benefits the community forever and becomes your personal legacy of giving. Simply, name a fund at the Community Foundation in your Will, or as the beneficiary designee of your retirement plan, insurance policy or charitable trust. Meet with the Community Foundation to develop a Letter of Understanding that outlines your wishes for your fund after your lifetime. It is kept on file at the Community Foundation and can be changed at any time at no charge. Individuals who notify us that they have made a gift through their estate to the Community Foundation will become a part of our Legacy Society.